It comes in several beautiful colors to suit your taste, with very bright colors to a more conservative style, this bag is a product to be considered if you travel light. 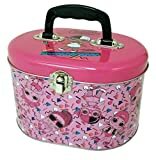 It has a wide internal space for you to pack all the things you need. It´s a safe bag because of the material it is made, that means that it keeps the contents safe from possible damage. 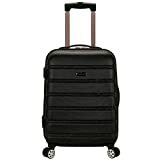 It can hold clothes for a week, at least a pair of shoes, and at least two extra bags without a problem. Fits perfectly in overhead compartments. 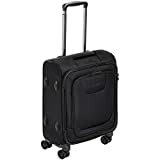 It has the perfect size for short trips because the size of the bag is perfect, it fits most airline overhead compartments. The versatile wheels are something to be highlighted and the handle extends easily and it accommodates for different person heights so far. The versatile wheels are something to be highlighted and the handle extends easily and it accommodates for different person heights so far. Something that really stands out is the beautiful design. It really is very light and has a waterproof and safe exterior. It has a TSA lock. The price is competitive in the market considering the advantages it has over other brands. Not recommended for extensive traveling unless you are used to traveling light even on those occasions. 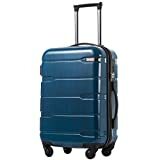 In sum, the Rockland Melbourne Expandable ABS Carry-on Luggage has a very good price/quality ratio, it has remarkable advantages that place it higher than its competitors so far, and it has the bonus of having a beautiful but comfortable and practical design to fit everything that you need for your short travels.